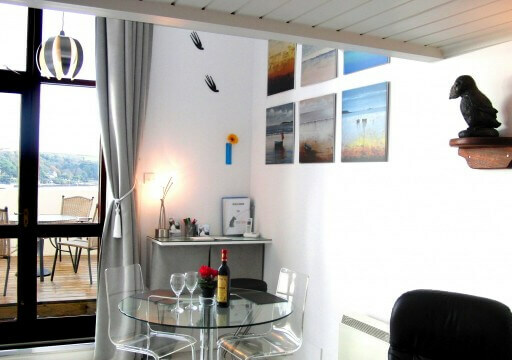 This beautifully-designed studio for two provides magnificent views from throughout the flat across the Fal Estuary with its network of creeks and rivers and colourful boating activities. Puffins was entirely refurbished to a very high standard by new owners in Spring 2008 for their own comfort and pleasure when in the UK and is immaculately maintained. Complementing the view, Puffins’ cathedral high walls are a showcase for works by Cornish & Scillonian artists. 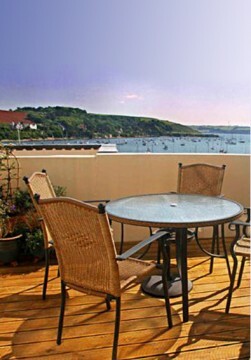 With secured parking, free broadband and telephone, and every modern convenience, Puffins provides unparalleled value in Falmouth’s choicest location. Situated in historic Packet Quays, Puffins is a great location all year round for visiting any of Falmouth’s many attractions on foot, including Pendennis Castle, the National Maritime Museum, beaches and many wonderful gardens. Alternatively explore the traditional waterways by ferry, boat tour or chartered yacht. Or, as any easy day trip, visit any of Cornwall’s famous sites, from Tintagel and the Eden Project to Goonhilly and Land’s End. Within minutes walk of pubs and superb restaurants; banks and supermarkets; galleries, antique and craft shops. Those who enjoy cooking will find fresh seafood, choice produce and baked goods in Falmouth’s bustling town centre. The RCYC, Falmouth Marina, and Ships & Castles Leisure Centre are in walking distance; fine golf courses and National Trust gardens are nearby.